Hey, it has been a long time since I have said anything here! I have been working... absurdly hard. I have not been working on the Witch Game. That is my "current project" and I'll be going back to it soon, but I had a bit of a holiday interruption with another project, that is now just about done. Unfortunately, I can't share that project with you right now, but I can tell you that some version of it will be in your hands to play within the next couple of months. I'm mainly just popping in to let you know that for the following week, I will be taking a nice long hearty vacation from all manner of work! I will still reply to emails, but I'm not going to do anything else that could be construed as work. I'm going to try very hard to truly throw work aside and actually let my brain rest for the first time in my life. I've taken vacations many times in the past years, but I don't know that I've ever done it seriously. I'm burned out. Really badly. I find that I can only work for about half an hour before I start thinking "Hey, don't I deserve a WoW break yet? ", and I think (I hope!) that is the result of having been in crunch mode for years straight. Every time I finish a project, I just launch the next one (or I launch it halfway through the previous...). It's time to really rest and see if my mental energy can recover, and maybe I can be excited about getting work done and not feel like I constantly want to take a break. I don't know, I think we shall see after this week! 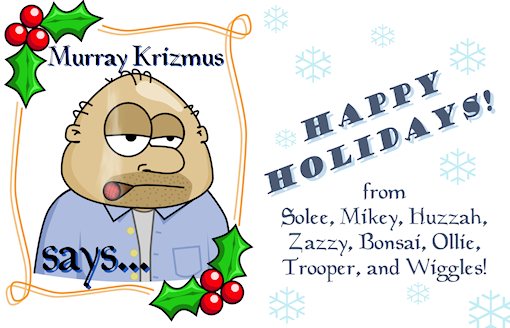 See you all in 2012, when the world ends, and Diablo 3 comes out! Okay, this is going to cause controversy, so please read the disclaimer on the page and understand... I have had people come to me wanting to buy Monster Cards. I also have a desire to ensure the "game" of trading Monster Cards isn't broken by people dumping in Yerfbucks. So, as a result we have The Monster Shop. The cards are expensive, and you can't buy them with Yerfbucks. That's because I don't really think you should buy them. But if you have too much money and you don't know what to do with it, or you are looking for a way to donate to Hamumu for some reason, The Monster Shop is here for you! I'd prefer if you spent your money buying Dumb games, even buying them for your friends or enemies or third cousins, but if you are obsessed with Monster Cards, you can buy them now! Enjoy! 26 comments Back to top! * I wrote a bunch of unrelated stories, many unfinished, which is not valid Nanowrimo success. But for my own self, I say I won. I just didn't punch it in at the official site since it wasn't legal. Look at that! The green line is how many words I should've had on each day, and the red line is how many I did. As you can see, I started out just slightly ahead of the game, but that evaporated very quickly. Then as Thanksgiving approached, I fell further and further behind. I had two days in there where I wrote zero words because there was so much else going on. But check out the very end there! Steep steep line! On the last 4 days of November I wrote 3,000, 4,500, 4,500, and 3,500 words respectively. Monster comeback, very painful. Why do you care about all this? You don't! But since I pulled it off, I get to shout about it anyway! Chew on that. Because I'm still buzzing with the fresh sweaty juices of victory (see that descriptive writing skill I developed this month? Not gross at all), I'll also detail what I wrote, just for my my own amusement. To answer a lot of comments on the previous entry, no, you won't get to read these. First drafts are never for public consumption, and with good reason. You wouldn't enjoy it, and you'd stop before you got very far anyway, so you're not missing out. Any stories I get beyond the first draft stage I may be willing (or interested even, for critique) to have people read them, but nothing I wrote this month is Hamumu-appropriate, so that would have to be handled outside of the confines of this family-safe site. I like swear words. So, here's what I wrote, in chronological order as best I can remember... First: Antarctica, a very unfinished (maybe half done) short story about scientists working in Antarctica and of course, as usually happens, they're attacked by an alien presence. Or possibly just visited by one, I don't know because it never got to the actual attack part. In Between, an also very unfinished story about a kid who can walk through mirrors into a void and then come back through any other mirror in the world. That's a daydream power I thought about a lot in my teenaged years and decided I'd try to put it in a story (it's not really an especially great power, but it has interesting and complex implications, which is why I thought about it a lot. As a game designer, I find playing with rulesets very interesting). Settling Up, a finished story! This one started with no idea at all of what I was gonna write, I just started writing and it turned out to make sort of sense, and it tells the story of a guy woken up in the night by something horrible sounding coming up the stairs. I don't know if it's any good, I haven't gone back to read it, and I'm scared to (not because it's scary, but because it's probably bad). House Of Doors, another very unfinished story about a guy who buys a house that is absolutely jam-packed with doors. It has doors that lead to closets, only those closets have doors on all the other walls too, like the house is just one big grid of teeny tiny rooms. I didn't get to the part explaining why it was like that (I'm not sure), or why he got obsessively interested by all these doors, or the part where eventually (it had to happen, right?) something supernatural involving the doors occurs. A lot of times I come up with "story ideas" only they're just setups, not actual storylines, and this is one I've had in my head for a while. Those doors definitely have to lead somewhere other than just into the house... right? Fantasy Novel, a maybe half-finished fantasy novel! This is what I spent about two thirds of the month working on. It features a gunslinger, a "wind dancer" (that's of course somebody who has magical powers over the wind), and what might pass for a rogue, and they have to deal with a witch's evil plot. Or they will eventually. I wrote it right up to about the point where they learn of the plot. But you'd be surprised how much stuff takes place before that! I kind of like the plot, I think, if it ends up going somewhere. Then I threw in another day of writing just in short form the events that would take place in the rest of the book, or at least a long way further. Then I quit. I feel like it had some interesting and original ideas, but I got bogged down just trying to write it, and it most likely reads very badly. Novel writing is definitely much more daunting than short stories. On Thanksgiving, I wrote a complete story in one very quick sitting! It's a short-short, entitled Thanksgiving. It's better left as a surprise to the reader, seeing as how it's so short and there's a twist or two, but it's basically a list of things the narrator is thankful for. It's very dark. And boy did it just pour out of me! I'm an awful person! Rite Of Spring, another finished story! This is actually based on the song of the same name by Angels and Airwaves, but extremely loosely. I just listened to it and started writing. It's a sci-fi story about a guy who runs a simulator of the world, where he can watch different variations of history. There's really not much story to it, it will be interesting to see what my Special Reader says about it. I'm not even sure it actually has an ending, it's just kind of odd. True Love, a finished story! I wrote this one after discussing the idea with my wife on our drive back from Thanksgiving. It's a rather nasty idea (I don't write happy stories), and again, I don't want to spoil what that idea is, so I'll just say that at the start, it's about a guy who's really interested in a girl, but he doesn't have the guts to talk to her. Night Driving, another finished one! The end part of the month was chock-full of nicely finished tales. Well, finished tales. This one was also from a discussion with my wife while driving - you might guess we were driving at night, and you'd be right. I just wanted to describe what driving at night looks like, so I did, but I needed a story around it, so the driver ends up hitting somebody. Problems ensue. And part of the fun of writing is that the problems weren't what I thought they'd be when I started. It ends up going to a very different place than I had ever imagined, which happens to some degree with every story. So writing a story is almost like reading one - you never know what's going to happen. Purgatorio, finished again! This is actually a pretty long short story, written over two of those very long writing days at the end of the month. It's about a guy who's murdered, and he ends up in Purgatorio, which is a very bureaucratic afterlife, that offers you choices about where you want to go next. The Inquisitor, a finished story! I started this at the beginning of the month, and came back to it today to wrap it up on my final writing day, because I liked the feel of it. A straightforward horror tale, perhaps vaguely (I wish) in the Lovecraftian arena, it's the story of a weird isolated town which an Inquisitor is visiting because the government for which he works heard the town didn't have a church (that's a no-no according to The Culture). You know it's never a good idea for an outsider to visit a weird little town. And when I finished that story but still had 500 words left to write, I threw together the beginning of a story I just called Teenage Angst. I don't even know what it would be about if finished, so far it's just a kid laying on his bed, listening to music as he thinks about how much he hates the bullies at his school. So that's it. On the one hand, I feel like I copped out by not doing a novel all month. There's no question in my mind that the real Nanowrimo challenge, of writing a single continuous novel, is far harder and a whole different type of challenge than writing 50,000 words of stories. But on the other hand, now that I've written all these stories, I have something I can use. I will be able to turn some of these stories into something people will read and enjoy (and maybe pay me for? Maybe?). If I had just written a novel, it'd be trash. I know that from the partial novel I did this month, as well as the horrible attempts I've made in previous Nanowrimos (I won once legitimately, with something that I later found and tried to read, and it was absolute garbage, not even worth trying to rewrite. I also failed another year, with about a half-finished garbage novel). So I feel good about what I did, and I think I really improved my writing abilities. Maybe. I guess we'll see. The hardest thing is definitely forcing yourself to go from a piece of writing to a finished work that actually has an ending, and by making all these stories, I had to do that a dozen times over. The endings are clearly the weakest parts of what I wrote in every case, but just the fact that they (sometimes) have endings feels like a victory to me. In other news, Sol Hunt won yesterday, legitimately. A single 50,000 word novel, about a teacher's first year of teaching! Bigger congrats to her for beating me in two ways. And big cheater for writing exactly what she knows. I would've never finished if she hadn't kept pushing me onward, so yay to her there too. Also, we watched no TV for the entire month, except when we were at my sister's for Thanksgiving, and that wasn't our fault. So that's another fantabulous victory for us! Tomorrow, we are totally watching Misfits. I gots ta write mo'! November has just about concluded. There are two days left, and I am giving up entirely on making games for them (as I have for the last couple days, recuperating from my Thanksgiving vacation! ), so I can make it to the dreaded 50,000 words for Nanowrimo! I'm not actually officially competing because I'm not doing a single novel. And I do understand why that's the rule. It makes sense - keeping yourself on that one solid task for the entire month is a monster achievement. I'm not achieving that. But I am surely going to get 50,000 words of something down! I have to write just under 4,000 words tomorrow and the next day to pull it off. Today I wrote around 4,800 so it's clearly possible. But on the other hand, that's the first time I ever came close to that all month (which is of course why I have so many words left to go!). There were some days where I wrote none at all. So that's my focus now for the next couple days! If it's all I'm working on, I gotta be able to pull it off right? Nothing works quite like enforced creativity. What I've done with my 40,000+ words so far is about 22,000 words of a novel (a very bad fantasy novel - my theory was that in fantasy, you can just make stuff happen as they go along on a quest, and just keep writing because you can always have something else attack them. Turns out it's still hard to write), a bunch of started halves of short stories of various lengths, and then just a handful of stories written all the way through. Most of those would qualify as flash fiction because I did them in a single day, making them under 2,000 words and some under 1,000. Some of those, just a select few, I think are gonna work! Somebody somewhere might like them, if I edit them up nicely. So I feel like I got something out of this month of labor. Maybe. Wow, that preview image is shocking looking. The actual video is much less bright, click it to play! Witness the cool explosions I borrowed from FrankieSmileShow (who graciously created them as free art for the Assemblee competition on Tigsource). And other stuff. I bet I've used this title before. 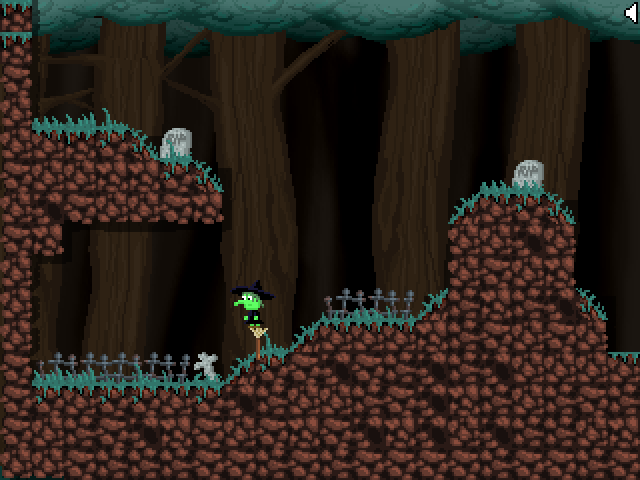 So, behold something sort of like gameplay in Witch Game! That orange rose is a skeleton blowing up, with a very cool explosion that I borrowed from the Tigsource Assemblee stuff. Free art, very nice (This one is by Frankiesmileshow, to give some credit). 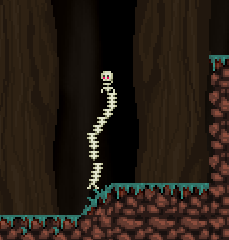 So, skeletons limp around, and you throw your broom at them to blow them up. It's nice. Progress is slow, because the focus this month is on Nanowrimo. I'm only a little behind on that, but I've hardly worked at all on game development. It's not the best break overall because it's nonstop work (750words.com is an evil trap! ), yet at the same time, so unproductive. I laze out a lot and play a lot of WoW because I'm trying to simultaneously avoid my two obligations. No TV, though. We're trying to do a No-TV November, and as of today are holding strong. Well, holding, anyway. I've also created the first boss for Witch Game, though he's not fully implemented. You'll get to see it some other time. It is kind of disturbing, but in a way that you'd need to see it in action to truly appreciate (much like that explosion, which is really great in motion). Maybe the game really should be called Witch Game, so people can have conversations like "Have you seen that game?" "Which game?" "Exactly!" This is the silliest thing I've ever put in a game. I don't know that I'm actually going to keep it, because it really looks pretty idiotic. But on the other hand, it's quite original! All I've implemented is it walking around (just trying out different settings to see how it would look), but in theory you could attack it and each hit would knock out two rows of ribs (because that's how big one "piece" of him is), shrinking him down until you defeat him. He's certainly easy to hit! You have no idea how hard it was to title this entry without a B.H.E. acronym. Ah, I have just finished awarding all the Halloweenie trophies. I'm so sad - like every year, I made a new Halloweenie trophy for people who kept making BHEs for all the consecutive years it existed (we're up to 5! ), but this year nobody got one! Quite a few 4-timers, but nobody has hit 5. All that beautiful effort gone to waste. So, that's all over now! The site is back to its usual boring self once again, unless there are still remnants I've forgotten to clean up, like leftover party streamers. That was an exhausting month. And now I have so much I have to do today to get started on the next month. As the title of this entry implies, I am changing my focus for the month. It is November, after all, and that means it's time for Nanowrimo! I'm going to participate in that, but my goal is to write a bunch of stories rather than a novel, so I'm not officially participating. Just trying to write 50,000 words worth of somewhat quality writing. Or at least writing that will warm me up to get better at writing. In fact, this month has been declared (not by me, but by Powers Beyond My Control) an official No-TV month, which is a scary prospect. So, no TV, got some books at the library to get me feeling literary, and 50,000 words ahead of me. I'm not taking the month off from witch-game development, but the focus is definitely on writing. I will only be doing game work when all the writing for the day is done. But not today! Today I have so many other things to get done, with bills and royalties and charity and all that fun first of the month stuff! I guess I have to do a newsletter too, and Indie Indie Conversation, and a new T-Shirt of the Month. Yikes. I'm exhausted again. Danger: work-in-progress, unfinished, crappy shot below. 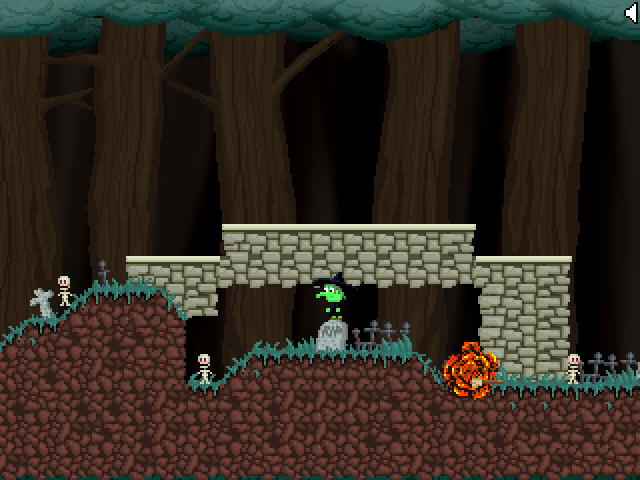 When my dungeon game petered out, I thought I'd just make a quickie platformer for Halloween, a real simple concept I've had for years and always wanted to do. The idea is pretty simple: you're a witch, and you run and jump and all that, but the unique mechanic is that you can throw your broom, and call it back to you once thrown. At its basic level, this is your attack. But as you see in the screen above, it has more exciting uses - stick it into the floor, and you can stand on the bristles. Stick it in a wall and you can stand on the stick. Stick it in a ceiling and you can hang from it. So you need to employ those techniques (and a couple others) to platform your way around. Simple enough. 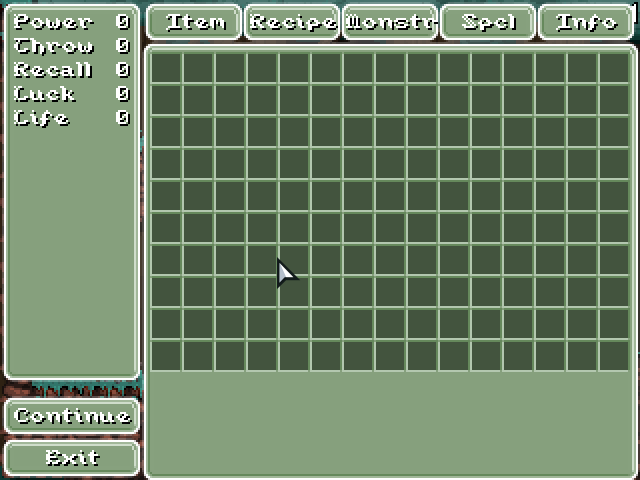 What I have implemented is the random item generator, and it's way cool. Diablo-style random items with various stats and procs. I'll be sharing more info on all this stuff in the near future, because I'm gonna talk about this game a lot! I'm very excited about it. Oh, and I don't know what the title is. I have one idea, but I feel like it's the world's most narrow parody that nobody will ever recognize. Let's just say it's the witch game for now. I'm gonna talk more about plans and things in the coming days, so stay tuned. For now, I go to sleep. This is a movie review... I will not outright spoil things, but if you want to really experience a movie fresh and clean, there is information below that will dirty you up! So beware of mild semi-spoilers. Synopsis: 20 years after his supposed death, Michael Myers (a mass murderer, if you didn't know) has come back, to hunt down his sister who herself is supposed to be dead, but apparently faked it. Smells like retcon to me. Stabbings ensue. Scariness Type: So many jump scares that they play organ stings when regular people step in from out of frame. Also a bunch of gore. Fun Fact: It turns out that supernatural killer invincibility is actually a genetic trait, as Michael's sister seems to share it. Good Stuff: Not what I expected to see! This movie is full of real characters, like with motivations and feelings. Really strange and surprising. I was also surprised to see how Michael, except for being utterly indestructible, is really just a regular murderer. It's not only that average people can knock him down with rocks and such, but also in terms of what he is capable of. Instead of being a mindless zombie like Jason, he's out there driving cars, fiddling with door keys, and just generally manipulating his environment like a real live person. So talented. One other really enjoyable thing was seeing the slasher story kind of played with a bit - the main victim in this movie was completely aware of "the rules". Truly a smart victim, who didn't trust his dead body to be dead. That felt really fun, and it worked both as a wink to slasher movies and in the context of the story - this woman was a traumatized survivor, she knew how it worked. Bad Stuff: Two contradictory bad things. On the one hand, my wife was yelling at the screen "Just kill somebody already!" after about an hour, and this is a very short movie! It's almost entirely setup, with just a little bit of payoff at the end. But on the other hand, let me reiterate the good thing about the characters being well-written - the fact that they all existed just to be fodder for a silly monster felt like a big letdown. Everybody brings up real issues, all these problems come to a head, and then... everybody runs around and screams for twenty minutes. And lastly, nothing too interesting about a guy walking around slowly and cutting people up with a kitchen knife. Once again, I defer to Freddy Kruegger and his way of making murder interesting and exciting for everybody involved. Classic Rules of Film: You know what was fun? Seeing this after recently seeing Behind The Mask. All the classic rules Leslie Vernon discussed were on full display. I loved watching Michael walk slowly after people yet still get ahead of them. My Take: Surprisingly good really, for what it is. Or rather, in spite of what it is - I don't think this is good at all as a slasher movie. There are very few kills, and most of the movie is just family issues rather than running around trying not to die. But it's an interesting movie and sort of high quality in a strange way. It's not great or anything, it's just a little unexpected. I'm a bit curious what other Halloween movies are like now! Wow, that's it! A month of movies. I think it came out to 30 movies instead of 31 due to issues, but I enjoyed it all the way. I hope you had a lovely Best Halloween Ever yourself, so good night, and good luck.